In 1987, Martin published a collection of short horror stories in Portraits of His Children. 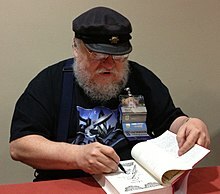 During this same period, Martin continued working in print media as a book-series editor, this time overseeing the development of the multi-author Wild Cards book series, which takes place in a shared universe in which a small slice of post–World War II humanity gains superpowers after the release of an alien-engineered virus; new titles are published in the ongoing series from Tor Books. In Second Person, Martin "gives a personal account of the close-knit role-playing game (RPG) culture that gave rise to his Wild Cards shared-world anthologies". An important element in the creation of the multiple author series was a campaign of Chaosium's role-playing game Superworld (1983) that Martin ran in Albuquerque. 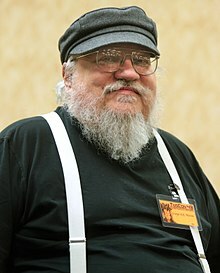 Admitting he became completely obsessed with the game, he stopped writing literature for most of 1983, which he refers to as his "lost year", but his shrinking bank accounts made him realize he had to come up with something, and got the idea that perhaps the stories and characters created in Superworld could somehow become profitable. Martin's own contributions to Wild Cards have included Thomas Tudbury, "The Great and Powerful Turtle", a powerful psychokinetic whose flying "shell" consisted of an armored VW Beetle. As of June 2011[update], 21 Wild Cards volumes had been published in the series; earlier that same year, Martin signed the contract for the 22nd volume, Low Ball (2014), published by Tor Books. In early 2012, Martin signed another Tor contract for the 23rd Wild Cards volume, High Stakes, which was released in August 2016. On November 20, 2015, writing on his LiveJournal blog, Martin advocated for allowing Syrian refugees into the United States. He supported Hillary Clinton in the 2016 United States presidential election, and criticized Donald Trump during the election and following her defeat, commenting that Trump would "become the worst president in American history". ^ Martin, George R. R. (2016-09-10). "A Salute to Immigrants". Not A Blog. Archived from the original on 2016-09-11. Retrieved 2016-09-11. ^ Schleier, Curt. 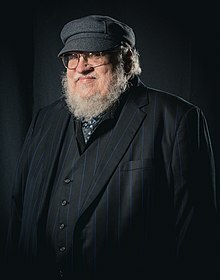 "Game of Thrones creator George R.R. Martin discovers he's a quarter Jewish". www.timesofisrael.com. Retrieved 2019-01-07. ^ "NJM Q&A: George R.R. Martin". New Jersey Monthly. 2013-03-15. Retrieved 2017-02-18. ^ "Bram Stoker Awards". Horror Writers Association. Retrieved 24 June 2017. 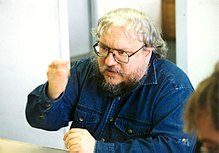 ^ "George R. R. Martin / Contemporary Authors, New Revision Series". Biography. A&E Television Networks. Retrieved 24 June 2017. ^ Martin, George R.R. (May 2001). Turtledove, Harry; Greenberg, Martin H., eds. "Night of the Vampyres". The Best Military Science Fiction of the 20th Century. New York: Ballantine. pp. 279–306. ^ Kerr, John Finlay (2009). Harrigan, Pat; Wardrip-Fruin, Noah, eds. "Second person: Role-playing and story in games and playable media". Transformative Works and Cultures (2). doi:10.3983/twc.2009.0095. ^ Milne, Ben. "Game of Thrones: The cult French novel that inspired George RR Martin". BBC.com. Retrieved 27 August 2017. ^ Flood, Alison (2018-04-26). 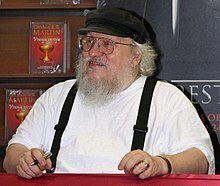 "George RR Martin: a new Game of Thrones book is coming ..." the Guardian. Retrieved 2018-04-27. ^ "The Books | Wild Cards World". www.wildcardsworld.com. Retrieved 2018-09-11.